For more information on any of these works please click on images. Greetings! I have decided to dedicate this month’s entire Holsten Galleries News to Lino Tagliapietra and to feature some exciting new inventory which I have recently received. Many of you know that this summer is Lino’s 80th birthday. Yes, at nearly 80 years of age Lino is still blowing glass and is in fact creating some of the most unique and beautiful pieces of his career. Kookaburra He has even premiered several new series in the past couple of years. Lino loves to work and he loves glass! And what a life he has had! At the tender age of 12 Lino began his apprenticeship with Archimide Seguso in his Murano factory and by the age of 21 he had mastered the centuries-old glassblowing Muranese techniques and become a maestro. Over the next 25 years Lino worked with some of the best known Murano glass factories. By the 1970’s Lino was developing his own designs which were then put into production at the factories where he worked. 35.5 x 22.25 x 6.75 By the 1980’s Lino had been invited by Dale Chihuly to teach his Italian techniques at Pilchuck Glass School in Stanwood, Washington. Thus began a rich exchange between American glass artists, who were hungry for Lino’s technical knowledge, and Lino, who was greatly impressed and influenced by the artistic freedom and experimentalism that he observed in his American counterparts. Throughout the 1980’s Lino continued to visit the U.S. and teach and also to collaborate with several well known American artists such as Dale Chihuly and Dan Dailey. At the same time he began making his own unique objects of glass art. These early works of Lino’s were created in various American hotshops where Lino was free to experiment free from the restrictions of the factories. Many of the pieces created during this period can now be seen in major museums and in private collections in the U.S. and elsewhere. 38.25 x 21.75 x 5.75 In 1988 Holsten Galleries began showing Lino’s work in our Palm Beach gallery during an exhibition of his work at a museum in central Florida. 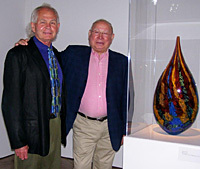 I would say that working with Lino has been one of the great collaborations of my 36-year career as a glass art dealer. It has certainly also been one of the great joys of my lifetime both to represent Lino and to call him my friend. Today, as you all know, Lino is widely considered to be one of the greatest living glass artists of all time. 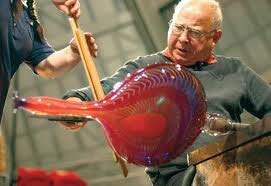 In fact, there are many who would consider the Maestro to be the greatest glass blower of all time. The number of awards, honorary doctorates, museum exhibitions and other distinctions that Lino has achieved are far too numerous to list in this newsletter. This very special birthday year for Lino is being celebrated by special events in Seattle, New York and many other places. I want to extend here my own personal congratulations and a big thank you to Lino for all that he is and all that he has done in our world of contemporary glass art. BRAVO, MAESTRO! MILLE GRAZIE, LINO!